“At first, it was chaos and football had no shape”. It is with these words that the English journalist Jonathan Wilson begins his fascinating historical analysis of the evolution of tactical patterns in his book Inverting the Pyramid. When football took off at the end of the 19th century, modern formations did not exist. It is from 1870 that one discerns the first systems with “three lines”, modern standards. Some decades later, the most present systems are the 2-3-5, is inversion 5-3-2 and the most common: WM. The WM reigns supreme in European football until 1950. After many coaches have tried to find a parry at WM, Gusztáv Sebes designs for Budapest Honvéd and the selection of Hungary a tactic based on permutations during the game, a big novelty. In coming back ward, the centre-forward offers a point of support to his two offensive midfielders, who can climb in his place and lead to a surplus. Hungarians are the first to advocate going beyond the role. This innovative principle favours the transition to 4-2-4. 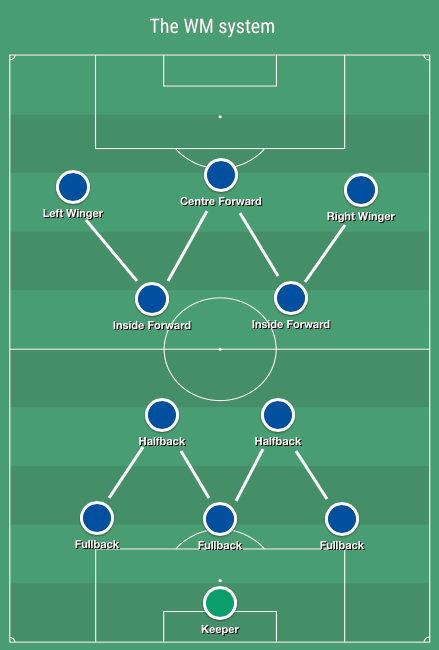 The Brazilians adopted this formula of 4-2-4 and made it progressively evolve in 4-3-3 during the 1960s; this positioning will remain the majority until the 1970s. At this point most of the systems we know today have been invented. The flat 4-4-2 makes possible an optimal grid of the ground, in the width in particular. The two lines of four defenders and four midfielders present a compact defensive block, effective in area marking. Today many teams, whatever their offensive organisation, are replacing in 4-4-2 once the lost ball. AC Milan Arrigo Sacchi, during the 90s, remains a reference in terms of organisation and grid of the field in 4-4-2, with a full zone defense and an offside orchestrated masterfully by the libero Franco Baresi. The diamond 4-4-2 or 4-3-1-2 generally ensures a numerical superiority in the heart of the game, useful for exercising an effective pressing. Many used in Italy and France, this system is quite difficult to set up, the lack of winger and the need for different profile in attack somewhat limits its integration. Nevertheless is more and more present these nowadays. The 4-3-3 allow a better control of the midfield in the offensive phase, while it is very manoeuvrable and it can turn into 4-4-2 or 4-1-4-1. It promotes a high pressing and creativity and facilitates the use of the full width of the field in attack. Pep Guardiola is unequivocally the manager who has developed this system the most, especially with FC Barcelona. The 4-2-3-1 or 4-5-1, which is very similar to the 4-3-3 but with a adaptability to counter attack. The two defensive midfielders in front of the defence play a vital role because they ensure team balance and serve as a link between defence and attack. It is not uncommon to see one or both of them assume the role of sentinel in charge of providing the first stimulus from the defence. The 3-4-3 or 3-4-1-2 (in fact, every three based defence) : they are really useful during transition phases, especially to annihilate counter-attacks. It also promotes attacks in numbers but it is quite risky to put in place as the role of the wingmen is important for the balance of the team. Though there are a lot of systems, there are actually few teams that use more than two or three. It is difficult for a coach to train all his players in several formations and expect that players can clearly understand what it’s going on in each system. Therefore, we could see in each league that there are two or three favourite systems. 4-3-1-2 or 4-3-2-1 in France, 3-4-3 or 4-3-1-2 in Italy, 4-3-3 or 4-2-3-1 in Spain, etc… Sure there are some exceptions, and it should not be forgotten that managers often change their disposition depending on the context and the opponent. What is interesting beyond that is the influence of few managers on a league or even in Europe. For example when Antonio Conte came in 2016 winning the Premier League with Chelsea he brought is Italian mindset with a 3-4-2-1, which he used to use in Italy. But now, no one has through the fact that a lot of Premier League teams now play regularly with three centre back in defence. 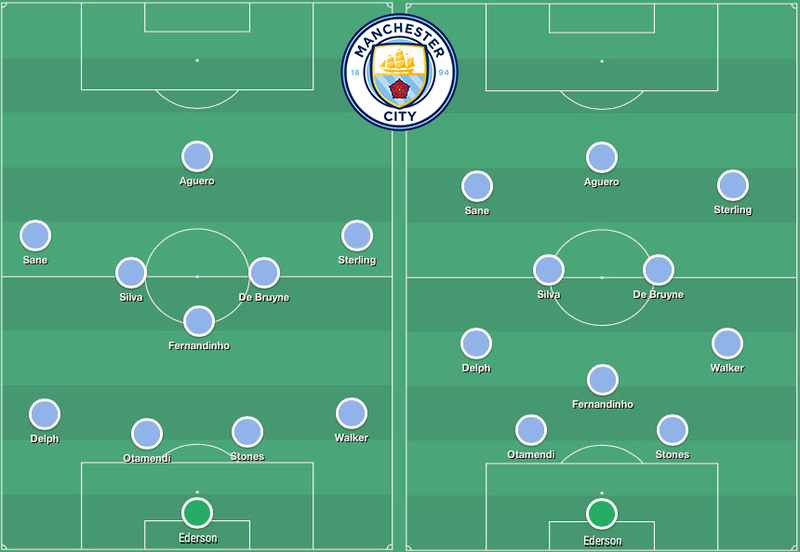 Tottenham, Arsenal, Everton, Stoke City and sometimes Manchester United or Manchester City play in 3-4-2-1 or 3-4-3 and results are very enthusiastics when you know that these systems were so little present in England before Antonio Conte. Another example : Pep Guardiola has totally changed Europe mindset with his 4-3-3 changing over time in a 3-4-3. Moreover his application and understanding of Johan Cruyff precepts like strong possession, pressing or being always in movement, he is one of those who have removed the “old number 10”, changing him into a sentinel able to leading the game from behind while disrupting the opposing playmakers in defence. Carlo Ancelotti with Milan AC in 2007 is one of the first manager playing with this kind of player with Andrea Pirlo. He play in same way with PSG more recently with Thiago Motta and even sometimes Marco Verratti in this position. These tactical changes made little by little abandon playmaker’s role behind the striker, as long as today it does not almost exist anymore. The second one looks very close to the WM formation from the fifties. So, can we question if there is some kind of pattern in the evolution of tactics over time? In fact, tactical changes are very specific to each league, like we saw with Antonio Conte who imposed is style in Premier League. Nevertheless we could see a certain trend going to the 4-3-1-2 with teams like Juventus, Atletico Madrid or even Real Madrid (Ronaldo playing more and more as a real striker nowadays). As long as there is no new breakthrough, as Guardiola has done with his style, tactical choices will be repeated regularly with some adjustments and some variations that are without doubt what makes the importance and the success of the manager in today’s football.